As Hurricane Irma finally died down, I tried to relax, but I was really worried about the storm surge. Information began to trickle in online. 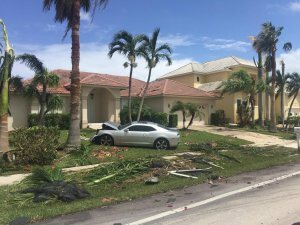 Tom is part of a Marco Island group on Facebook and people began checking in, posting photos of their houses and streets after the storm. There was nothing concrete and nothing specific about the area we lived in, or anything about the canals around the island. What we knew as that there was quite a few feet of flooding around the island from the rain, so any storm surge would be very bad. 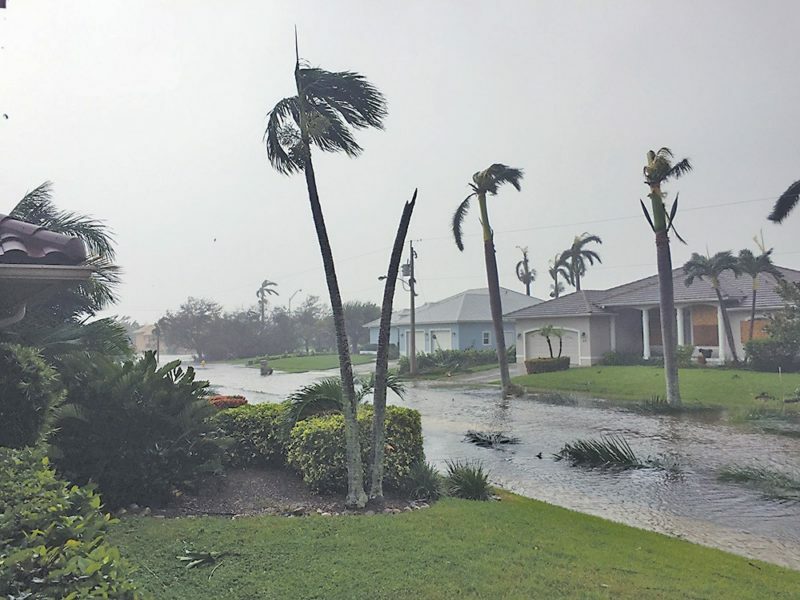 Some houses had serious damage (roofs peeling off, layers of exterior walls peeled away, windows broken, cars smashed on their driveways, boats up on lawns and strewn across the roads) while others seemed to just have a few bumps and bruises. All the houses on the island had significant damage to their landscapes (trees were just completely down across the island) and almost all the pool cages (screened in lanais) had been destroyed. An hour passed, and then two- still no sign of the tremendous storm surge that was predicted. The water in the Gulf of Mexico slowly flowed back in, and the water level was high, but it wasn’t a surge. And no one was mentioning any surge coming from the canals and into their homes. 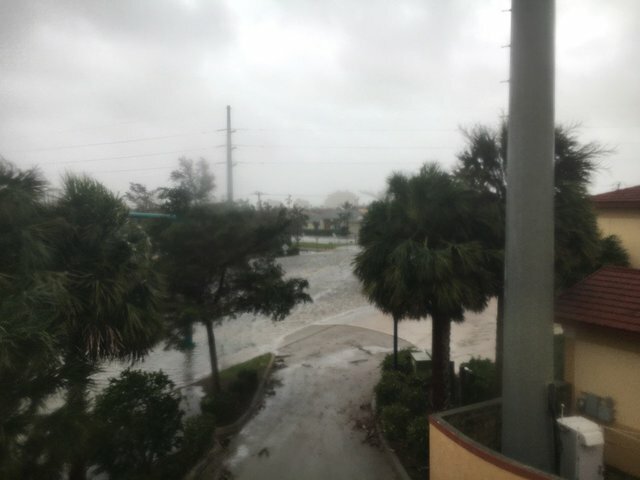 I don’t know how Marco Island managed to avoid a severe storm surge TWICE (with Wilma, it was also expected) but I was intensely grateful. There was standing water from the storm itself, and the canals were higher than they normally were, but there was no big surge of water. We waited and waited and waited for bad news, but it didn’t come. We just needed for the roads to be cleared of electric lines and debris so we could go over there and see what the damage had been from the winds and rains, so we could probably go the next day. I was overjoyed- I just wanted to go home so badly, and take on whatever the next challenge would be, with all of this behind us. I knew we had a lot to do no matter what shape the house was in, but as long as we had a house to return to, I would consider it something to be extremely grateful for, because it really could have been so bad. It was incredibly, incredibly warm inside the building – over 85 degrees- and before we went to sleep Tom managed to open the sliding door in the guestroom we were staying in to let in a little bit of a breeze. The storm shutters were still over the frame of the window on the outside, though, so it wasn’t much cooler, but it was air that was moving. The wind was still blowing outside, but now that we knew it was going away and not coming, it wasn’t as eerie. Grace, Tom, and I all collapsed early. We were so exhausted. My dad woke us right after sunrise the next morning- Monday. He called Tom and told him to get out of bed, that they were going to check the house. 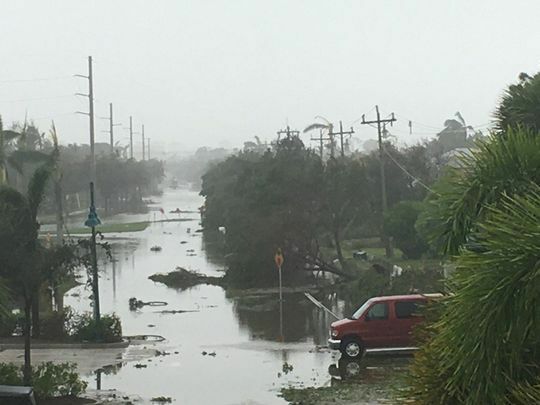 Marco Island police had asked people not to drive until they were sure that all power lines were clear and not active, but my dad decided he could navigate that without the go ahead. I think we all could have used a little more sleep (especially my parents- knowing them they were up all night cleaning), but my parents were ready to go RIGHT THAT MINUTE, plus Tom and I were eager to find out if the house had fared okay. When we woke up, there were tons of alarms going off in the buildings nearby- not fire alarms, but weird, braying sirens in repeating loops with static. There are a couple of timeshares and hotels near my parents’ building that were completely evacuated for the storm, so I think the emergency sirens must have been triggered after the power had been out for several hours. Before Tom left he managed to slide one of the storm shutters away from the door so we could get a little more fresh air in the VERY HOT room and also so we could get a look at the island. No cars, no people, just the battered landscape and the sirens- all the trees were trashed and there was debris all over. Tom left with my parents and I stayed with Grace (who was still asleep). I waited anxiously for him to call, and when I didn’t hear from him, I called him. They just got to the house, but everything seemed okay on first glance. Holy crap- the house was okay! I could have sobbed in gratitude, but I still felt cautious. And in shock. Tom called me back a few minutes later with the damage report: We lost three big trees (completely uprooted, but fell in a direction away from the house), a bunch of small trees and shrubs, chunks of our roof (mostly the tile on top of the structure of the roof, so it wasn’t as if the roof itself was ripped off), all the screens off our lanai cage (the cage was still standing, but the pool was full of debris and tiles from various roofs), our lawn and yard was a giant mess of palm fonds, bushes, tree branches, roots, building materials from the construction site across the street, tiles, etc., and there was a bit of damage inside the house- one of the doors to the attic had been blown in and there was insulation strewn throughout the house and some moisture from the rain, etc. Our fridge had started to defrost from the heat (it’s one of those “freezer on the bottom” kinds) and left a puddle of water in the kitchen. However, the house itself hadn’t been structurally damaged and there was no storm surge water inside. There wasn’t any power, of course, but we *did* have a trickle of water. The city was on a boil water notice, so we couldn’t drink it (we had bottled water for that) but we could shower and flush the toilets. Everything was a mess, but the island still existed and was habitable. As I waited for Tom to get back I was swimming in a whole bunch of emotions. Mainly, I felt relieved and thankful. And I wanted to hold on to that feeling, that relief. Things were a mess, absolutely, and I knew it was going to be a big deal to get the house cleaned up and repaired, deal with insurance, etc. but the threat was gone and it seemed like we dodged this incredibly tremendous bullet that so many people were so very sure was going to hit us hard and wipe us off the map. We could go home. The storm part of this whole situation was over. HOLY CRAP. All that anxiety and preparation and it was over. The worst hadn’t happened. After weeks of a lot of “the worst” happening, I think I was expecting this outcome to be dodgy, too. But it surprised me. It’s hard not to have your heart broken by that- all these people affected by the storm, all that damage they had to come home and discover and deal with. Everyone would have different things to find, different levels of how this storm would affect their lives. It just broke my heart, thinking about all the possible combinations for loss. 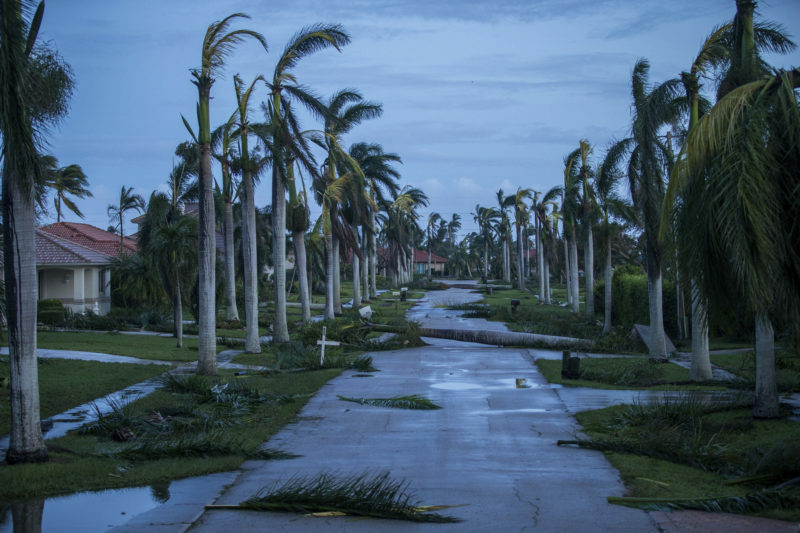 Homes majorly damaged, boats trashed, cars crashed, trees uprooted and stripped bare from the high winds… I know these are small things when compared to loss of life, but a person’s home matters. All those boats all over the place- a lot of people who have boats save up for them a long time, spend a lot of time maintaining them and caring for them. And then to have all of that just be flipped over on someone’s yard, or halfway sunk in a canal? It just seemed to symbolize the storm. Storms in general. Random and heartless. And even with all of this, we were the ones who got off “light” compared to Barbuda, and then compared to Puerto Rico a week later with Maria. The majority of us still had homes, and we all had our lives. I can’t articulate what I’m trying to say, so I’ll stop trying. As we pulled up to our street, and then in to our driveway, I felt a little shocked by the “new” appearance of the house- one of the large magnolia trees at the end of our driveway was down, the Cassia next to our front walk was also down, and the bushes on the sides of the house were crisp brown, I guess from the wind. There were so many trees down that I could see houses and buildings blocks away. It was much brighter without all the trees (and we didn’t have much to begin with- this island is largely buildings and houses.) It just seemed barren. And so quiet. 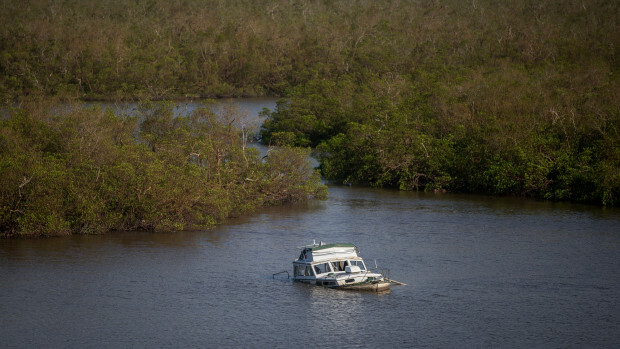 It just seemed like the entire island was an open wound – everything seemed vulnerable and bare. Roots exposed, concrete cracked, fences down, leaves stripped. Everything seemed like it was too wide open and exposed. It was a lot to think about. It still is- I know a lot of people bounce back from these things and are just grateful to get back to life, and there is definitely a part of me that is blissed out to be back in the boring routine of the every day as I write this, six weeks after the storm hit. But I’m still thinking a lot about the storm and the experience, and what happened with Hurricanes Harvey and Irma and Maria and all the people that were impacted in so many ways by all these insane weather events this year. I don’t think I’m going to be able to shake this whole experience off for a long time, to be honest. This is one of the most significant things I have ever been through. I think that’s why I am writing all of this and not just summarizing it up in one entry and moving on. But, bottom line- we had a home to return to. That was the most important thing, the best case scenario. As much as I was feeling the losses across the island, I was so very moved by the fact we all hadn’t lost more. We had a home to return to, a roof over our heads. What more can you ask for?